Looking to import all of your listings from eBay into the Products Catalog? Click on the Products Catalog icon on the left-side menu panel. 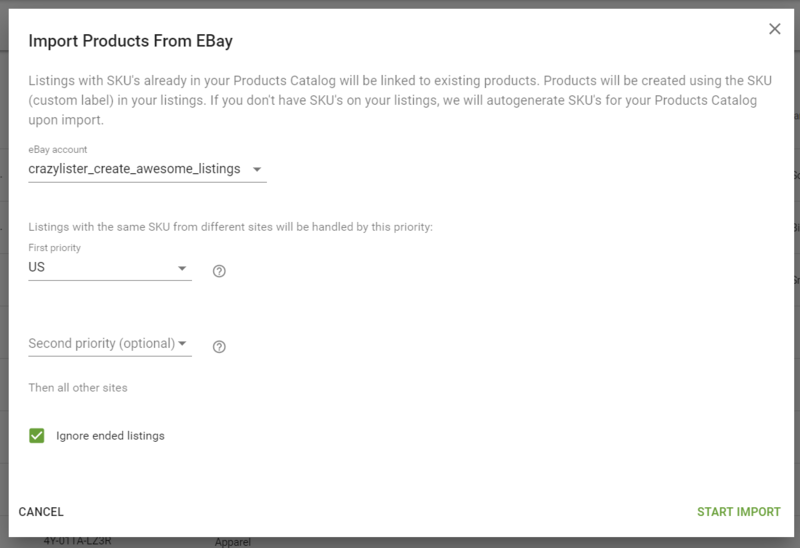 2) Click on "IMPORT ⮟" and choose "Import products from eBay"
3) In the pop-up window that appears, select the eBay account that you would like to import products from, and the priority eBay country site(s) by which the product data should be imported. If you sell on multiple eBay country sites, choosing a priority ensures that the products will be created using data from that site first before importing data from the other sites. If the same product SKUs exist on multiple country sites, only the data from the priority site will be used. Also note that the system will ignore ended listings by default. If you wish to import products using ended listings' data as well, make sure to uncheck the checkbox. Note: Listings with SKU's already in your Products Catalog will be linked to existing products. Products will be created using the SKU (custom label) in your listings. If you don't have SKU's on your listings, CrazyLister will automatically generate SKU's for your Products Catalog upon import. 5) Your products will now begin importing and populating the table on the page. Please note that it may take some time for all of your products to load, depending on the amount of products you have imported. Tip: To scroll horizontally using the mouse or touch-pad, hold SHIFT and scroll. Can I check the status of the import? Q: What product information will be imported? This import process will bring in all the basic information from your listings, including: Title, description, category, price, quantity, and policy information. photos. Certain information, such as item specifics, will not be pulled in and would need to be added afterwards. If you have any more questions, you can search our Help Center or, click on the chat tool in the bottom right corner and we'll be happy to help!